Union minister of state for agriculture and farmers welfare Gajendra Singh Shekhawat stressed the need to take up market-centered approach for the farmers to double their income by 2022 in view of rapid global transformations and claimed India is a leading food production country in the world. 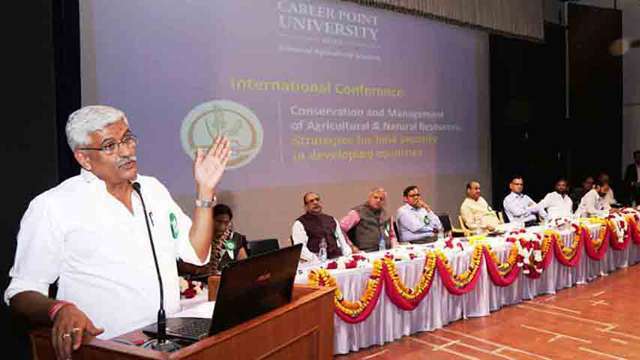 Union state minister Shekhawat was on Wednesday speaking in two-day international agriculture conference held in Career Point auditorium in Kota. Declining one more green revolution in the country, Shekhawat stressed on the need to focus on global marketing and added a fresh revolution in agriculture can be initiated only through transformation. He informed that MoUs worth Rs about 124 lakhs corers have been signed for setting up various types of processing units. India is matchless in milk production and leading one in food production. Shekhawat said efforts would be made to knock the doors of 104 agro-industries of the country and to bring out technology and research to the land. The natural resources for agriculture should be identified and make their best use, he said. The minister referred to the olive tea production in the state and said it is helpful to cure 12 types of cancer. The minister informed about 2.50 lakhs students are currently undergoing agriculture courses in the country and the ministry is chalking out a strategy to contact to at least one lakhs of these students and to build up a workforce that can move among the farmers regularly and transfer them value addition and new techniques. Shekhawat informed that MoUs worth Rs about 124 lakhs corers have been signed for setting up various types of processing units. India is matchless in milk production and leading one in food production.